Here’s an example of the challenges of managing information inside a big corporation. 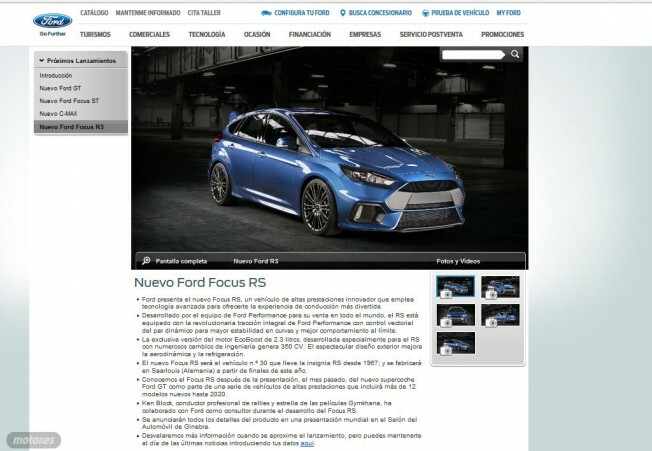 When Ford’s own official line at the event introducing the Ford Focus RS was “at least 320 HP”, Ford of Ireland and Ford of Spain apparently didn’t get the memo that the HP was secret and put it on their own websites. Yes, 350PS, or 345 by our system. Here are the screen prints from the Ford sites (with the HP figure since removed). But let’s take a step back for a moment. Wen Ford management approved the RS project, target HP and torque targets would certainly have been a part of the overall specification and budget. At that point a final specification RS engine wouldn’t have existed in physical form. However, given the method modern engines are designed, modelling across a series of computer programs would have yielded most of the design. Bench testing of the Lincoln MKC 2.3 liter engine would already have provided some experience and demonstrated that the 350 HP goal was feasible. Pushing the limits further on multiple MKC development engines would have yielded information about what was needed for durability, including some of the changes we heard about in the announcement such as the upgraded cylinder alloy and more robust head gasket. but even with near-final RS engines under test, with the target HP and torque achieved… real-world testing would still be needed to test compatibility and durability with the drivetrain, drivability, emissions requirements, and fuel economy goals. At this point the HP and torque figures could start to vary as necessary tuning is made. Hardware specs need to be frozen, but computer programming is still ongoing. And this is about the time the RS was announced to the world… so final figures can’t be given because they may still change. In the final months before production begins, fine tuning takes place. Road testing of prototypes continues, and computer programming continues almost to the end. More HP may be found from this fine tuning, or even less. But the final figures aren’t going to be announced until the manufacturer is ready to send the first car down the assembly line. And remember what the RS logo means at Ford: RS products comprehensively address every aspect of performance. Engine, suspension, drivability, both in the real world of daily driving and on the track. The Focus RS is much more than just its engine. An example of this comprehensive engineering approach is the Ford Performance All-Wheel-Drive system with Dynamic Torque Vectoring. Not a simple and cheap Haldex unit like the Golf R, but a comprehensive and total solution with torque vectoring front-to-back and side-to-side along with Drive Modes. This was not cheap or easy to engineer. It is very involved to design, program, tune, and is also expensive. But it makes a dynamic difference in handling and will also fully take advantage of all the horsepower and torque Ford will provide. Now take competitive considerations into account. There are competitors to this car in Europe, with more under development. How many secrets does a manufacturer wish to give away to its competitors ahead of time? Hence, Ford didn’t plan to reveal the final numbers until later in 2015.